Lion Technology Co., Ltd was established in 2004. With technology advances people may tend to neglect the importance of environmental protection. Therefore developed countries in the world like US, European Union, Japan, Australia, Asia, South America start to take the terrestrial environment ecology protection into serious consideration. Materials used in every kind of commodity have to comply with the environmental protection standards (RoHS), which is defined by international environmental protection organization and is implemented in full span now. Lion Technology Co., Ltd is devoted to the promotion of environmental protection and the development of commodities made with recycled paper. The company is run with consistent business management philosophy. Superiority and high capability is well maintained to develop products, which meet not only the demand of product functionality but also the requirements of environmental protection. Lion Technology Co., Ltd has invented a platform design of a kind of heavy loading buckle structure. This specialized technology uses light weigh paper as material to make many kinds of commodities in heavy load usage. Except to be used in high strength, high pressure resistant stack board and furniture this technology can also be used in many other applications. 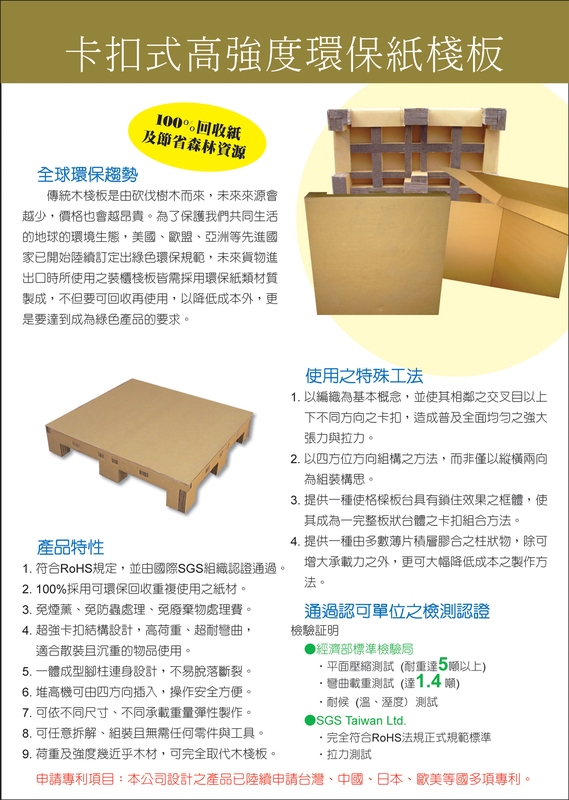 Lion Technology Co., Ltd presents products of green paper stack board and green paper furniture of which many patents in various countries have been granted. They also passed and accredited with SGS tests. The green paper furniture of our product series has been well accepted and become more and more popular in Europe, USA and Japan. The green paper furniture consists of the characteristics of nature, environment protection and recyclability. Their special cell structure of Kong-Ger design is particularly favored by the users. Stack board can be made with all sorts of environment friendly materials of which the green paper stack board is the most inexpensive products and conforms very well to environmental requirements. 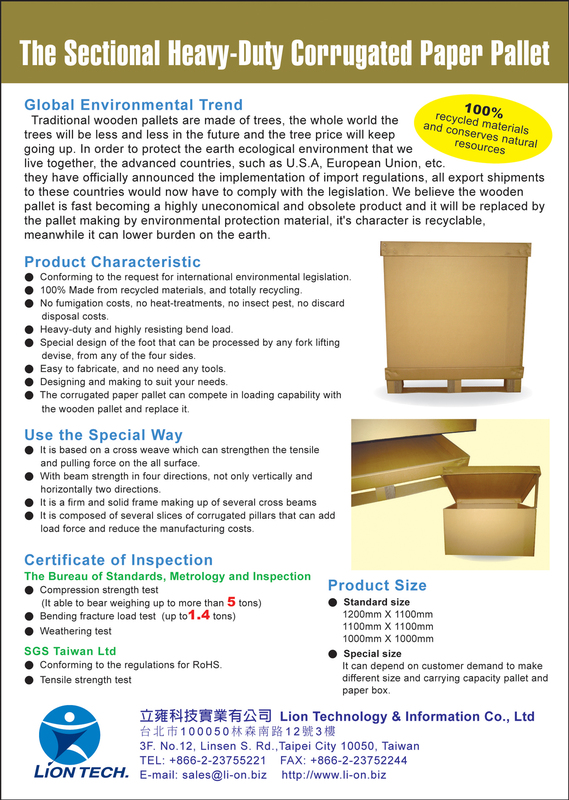 Our green paper stack board product is widely used by importers and exporters of many industries. Our specialized patented heavy loading buckle structure can sustain much higher load than other ordinary paper stack boards available in the market. Our green paper heavy load stack board is not only more endurable to heavy load but also higher in flexure strength. They are also easier to use with much less weariness. All these characteristics make our product lighter in weight, lower in cost and more friendly in environment. The stack board with our superior buckle design can be used in light industries, such as ceramics handcraft industries, in high technology electronic industries and in heavy industries of Metal, Heavy Hardware and Components. With high flexibility in design our series of stack board products suit well with all these kinds of demand. Now and in the future environmental requirements of RoHS and waste recycle will be widely stipulated and implemented so as to change the type of international trading. Our specialized patented design and capability of R/D will lead our company well in front of other makers in the industry and enable our company to provide better products for all the industries. Since her establishment, Lion Technology Co., Ltd has devoted continuously in the environmental protection domain. Our customers always persist in achieving higher satisfaction of their customers in product requirements and quality objectives. Although we have already developed and produced superior products, we are continuously putting more efforts in research and developing new technologies and methods. More series of products will be developed and used in our daily lives. Environmental protection is our company's key business philosophy. Quality is our company's key business objective. And talent development is the life of our business operation. The company will always stick to these business management philosophies to serve our customers, to develop further and grow together with all our employees. We all work together to contribute to the protection of the global environment.